The post has been updated to reflect current information. 29 March 2018. Isabel Moura Mendes has been a programmer for the Royal African Society's Annual Film Festival in London since 2013, following her stint at (AiM) Africa in Motion Edinburgh African Film Festival. In addition, with Isabel's support, the IberoDocs Festival was founded in 2013 by Mar Felices and Xosé Ramón Rivas. The first showcase for Ibero-American culture in Scotland, focussed on documentary films by Spanish, Portuguese and Latin-American filmmakers, has objective to create an annual event in Scotland that facilitates the understanding of migration and stimulates cultural and social integration. Isabel Moura Mendes, of Cape Verdean origins, found in (AiM) Africa in Motion Edinburgh African Film Festival, a space to develop her interests in African culture and to hone her skills in arts and cultural management. She talks about the goals and objectives of the Festival and its plans for the 2012 edition and the future. 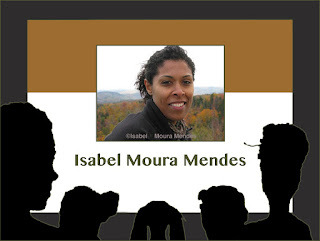 Isabel, please talk a bit about yourself, your background and your experiences with the cinema while growing up. I am the daughter of Cape Verdean immigrants in Europe. In 1975, in an act shared by so many African families across the continent, my parents left their homeland and the barren mountains of the island of Santiago, in search for a better life in Portugal, the country that, until the year before, claimed Cape Verde amongst its colonised territories. It was thanks to their sacrifices that I was able to pursue my education and major in Media Studies and Journalism, thus becoming the first in my family to hold a college diploma. My particular focus on the written word clearly sprung from my lifelong interest and relationship with the arts and its multiple manifestations. I have always been drawn to the positive transformative power of arts and this fact, along with my desire to more fully understand my identity and sense of belonging, have shaped both my personal and professional paths. I have worked with different outlets in media both in Portugal and Cape Verde. In 2004, I was appointed co-Director of the arts training exchange program between Cape Verde and US Centre for Creative Youth/CuturArte, and later that same year, took over as the head of the state-owned Cape Verdean national television channel, TCV. My love affair with African film started in 2006, when I collaborated with the documentary training scheme, Africadoc, with which I worked until 2008. Through this connection, I had a chance to be involved in the production of a number of African lusophone documentaries and to meet inspiring filmmakers such as Flora Gomes, from Guinea Bissau. How do your studies connect to cinema and how did you become involved in the African in Motion Film Festival? My (very fortunate) encounter with Africa in Motion happened in 2010, when I moved to Edinburgh, Scotland, to pursue a Masters degree in Arts & Cultural Management. After having worked as an arts manager for almost 3 years in the US, I became certain that enabling artistic events which emphasise multicultural and interdisciplinary understanding, critical thinking and leadership, is what I am most passionate about, and what I am best at. That is why I decided to pursue my studies in this field. At the same time, I also have to admit I had been following AiM's work since 2007, so, almost as soon as I landed in Edinburgh, I sought out a way to become involved with the festival! Lizelle Bisschoff, festival founder and director and Stefanie van de Peer, co-director, were kind enough to bring me on board and utilise my skills to the advantage of AiM. The rest, as they say, is history! I am truly proud of being part of an organisation which has as its core aim the desire to create opportunities for Scottish audiences to see African films while providing a platform for African filmmakers to exhibit their work in Scotland, and in that way change perceptions of Africa. We truly do believe that the best way to learn about Africa is to listen to African voices and to view representations created by African's themselves, as these often counter the stereotypical representations of Africa prevalent in mainstream media. But our main reason for screening the films is because we believe they are great films which should be seen the world over. Professionally and personally I could not be happier in giving my contribution to move this proposition forward. In 2007 I was invited to speak at a panel organised by the festival and attended many of the film screenings and am very impressed with the evolution of the festival. Please talk a bit about its history. Africa in Motion has proved very successful over the past six years. From the first edition of the festival in 2006 to 2011 we have screened over 200 African films - a significant portion of them being UK premieres - to audiences totalling around 15,000 people. These numbers are indicative of our ability to reach wider audiences by including new events, reaching out more widely in press and marketing and also succeeding in making the festival known in niche communities such as the African Diaspora in Glasgow and Edinburgh, as noted every year, by our audience feedback. The consistently exciting and varied film programme and the broad offer of complementary events, such as talks and discussions, workshops, masterclasses, seminars, art exhibits and live performances by African artists/musicians, are what makes AiM an anticipated and popular event in the Edinburgh arts calendar. In response to the demand we received from both our younger public, and also audiences outside of the urban centres, we have devised and expanded specific programmes for children and youth in our festival programme, as well as implemented tours to schools and rural areas in Scotland. These outreach activities have not only expanded our festival's reach, but have enabled us to create new audiences for African film. Similarly, the multiple partnerships AiM has established with other festivals and arts organizations throughout the UK, Europe, US and in Africa itself, have granted long-term benefits for the filmmakers that have been part of our programmes, namely by extending their film’s longevity and increasing the potential that they will be picked up and programmed by other festivals. Finally, the ever-growing number of film submissions we receive every year, and the prestige that our festival has gained, both nationally and internationally, confirm to us the importance of a festival such as ours. What has been planned for the 2012 edition in terms of theme and events? This is an especially exciting and crucial time for AiM. We have just launched our calls for submissions for features (documentaries and fiction) as well as for our much-anticipated short film competition, now in its fifth year. We have also just unveiled the theme for the 2012 festival, which, as usual will take place in the Fall - 25 Oct to 2 Nov 2012. This year, Africa in Motion will be looking at 'Modern Africa'. What we mean by this is that we will focus on films and events encapsulating Africa in the 21st century. We will host screenings and events that represent Africa as part and parcel of the modern, globalised world – the urban, the new, the provocative, the innovative and experimental. We regard “modern” not as belonging solely to the “West”, and through the festival we want to emphasise Africa’s important role in the modern world. We are interested in discovering and exploring how modernity manifests in African cultures, and, once again, counteract the stereotypical view of a continent locked in ancient traditions and superstition. For that reason also, we are bringing back our academic symposium series this year, and have already put out a call for papers on themes related to African popular culture. International researchers are invited to present their research on contemporary African popular culture, which not only includes film, but also other manifestations of popular culture in Africa such as music, dance, street art, sport, theatre and literature. We believe the symposium will further enhance our festival theme. In addition to these preparations for the festival in Edinburgh, AiM is taking on board the increase in demand we have received from Scotland's largest city, Glasgow, and its African Diaspora and cinephile communities. As a result, we are developing a plan to expand the festival's impact to Glasgow, and potentially implement a fully-fledged Africa in Motion film festival there in November this year, after the main festival in Edinburgh. You are the new director of the festival, having taken the torch from co-founder Lizelle Bischoff, what are some of your goals for the festival and future plans? The expansion of the festival to Glasgow is already part of a larger strategic plan we are currently developing for AiM. After 6 years of excellence in film programming, inspirational guests, discussions, and events, AiM has built a strong track record and enviable reputation, recognised by our partners and competitors alike. This team—in which Lizelle is still very much involved, albeit in a less executive and more advisory role—now has the responsibility to uphold this legacy, and, at the same time, take the festival's proposition forward. This means working on developing a more structured organisational composition for the festival, which will enable us to shift from a mostly volunteer-based to a more professionalised and skills-based formation. Steps such as obtaining charitable status for AiM, establishing a high profile Board of Trustees, are some of the actions we are implementing in order to give us the organisational stability we need to ensure the continuation of the festival. This will support the growth of our festival, not only regarding its geographic scope, but also in terms of expanding our current activities, to include creating African film distribution and production opportunities in the UK.